﻿Wildlife Rescue South Coast Inc. is a registered incorporated association and a registered charity. We receive no government funding and rely on your generosity and support. Please help us to continue looking after our wildlife by visiting our donation page﻿. Wildlife Rescue South Coast is a large and experienced wildlife rescue group in the south eastern area of NSW which has been licensed by the NSW National Parks & Wildlife Service (NPWS) since the late 1980's. Our members are all unpaid volunteers and if you wish to join us visit the Become a Volunteer page under the Home tab. We cover the NSW South Coast regions from Wollongong to the Victorian border, taking in the Illawarra, Southern Highlands, the northern part of the Southern Tablelands, Kangaroo Valley, the Shoalhaven and down to the Eurobodalla and Sapphire Coasts. Wildlife Rescue South Coast’s primary aim is to rescue and rehabilitate injured and orphaned native wildlife to eventually release them back to the wild. In NSW it is illegal for anyone not holding a licence (or valid permit) to capture, keep, transport or harm any native wildlife. Many native animals are left suffering on the side of the road after being hit by a car. Some have babies in their pouches who will die of starvation if not rescued. * It is important to keep all rescued wildlife warm, dark and undisturbed, and to get them to an experienced carer as soon as possible. Buy your 2018 calendar today! 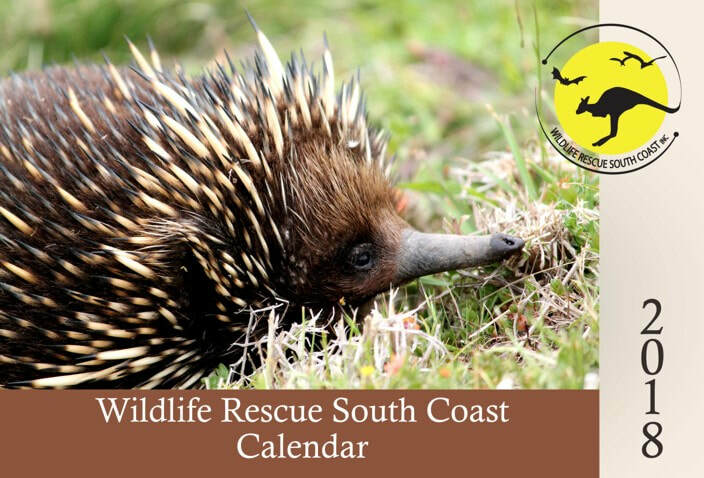 Still only $10* the Wildlife Rescue South Coast calendar is the perfect way to record all your events throughout 2018. Just click on the above cover photo for more details and to pay using PayPal. For more information on Echidnas please visit our Echidnas page.